Read the full feature here, and our archive of Banned Books essays here. In her letter to me, dated 11 May 1985, the Russian poet Inna Lisnyanskaya (1928–2014) writes: “My friends and I like your dress more than the Paris one—it’s a complete whole.” Thirty years have passed since I received this letter. Will future readers of this correspondence realize that “dress” is code for books? The preferred dress refers to the original Russian-language text of her book Poems. On the Verge of Sleep, published not in Moscow but in Ann Arbor by Ardis in 1985; the French dress is the Russian Rains and Mirrors, published in Paris two years earlier. I had sent out both publications from Moscow through the diplomatic pouch. Lisnyanskaya was persona non grata in the Soviet Union and could not publish. The succès de scandale of the literary almanac Metropole (Russian edition, Ardis, 1979; published in English by W. W. Norton in 1982), which presented the work of 23 Russian authors who dared to request permission from the literary bureaucracy to publish an anthology of their work without first submitting it to the organs of state censorship literally decided Lisnyanskaya’s fate. When the request was denied, Metropole was published by Ardis in Ann Arbor, as had been arranged with the editors. Two of the junior contributors were expelled from the Writers’ Union. Lisnyanskaya, along with her husband, Semyon Lipkin (b. 1913), the elder statesman of the group, and Vasily Aksyonov, the writer among them best known in the USSR and the West, resigned from the Writers’ Union in solidarity. Union membership in the Soviet Union meant not only the right to earn a living from writing, but came with superior medical care, writers’ residencies, housing, and special food provisions (I was treated to the weekly chicken every Sunday at Inna Varlamova’s, a neighbor and friend of Lisnyanskaya’s, during the winter and spring of 1980–81, and caviar at New Year’s). The Metropole affair both silenced Lisnyanskaya as a poet in the USSR and liberated her from the restrictions imposed by publishing. At the time of the Metropole affair, Lisnyanskaya had been publishing for more than 30 years. Yet, like Lipkin, outside of a small circle of friends she was known primarily as a translator, often the fallback for writers who could not publish. Her most recent book, in her words, had been “stripped and plucked bare by several stages of editing.” Now, post-Metropole, she was free to publish two books abroad that would never have passed the censor. But she paid a price for that freedom. In her Ardis book the date on the copyright page is given as 1984 and a notice on the last page states that it was printed in Ann Arbor in November 1984. The book, however, was printed in 1985. The reason behind this harmless obfuscation was simple: Lisnyanskaya had endured several run-ins with Soviet authorities. Exhausted by threats and intimidations, she agreed to halt publications abroad, but informed the authorities that she could not stop the 1984 publication of her Ardis book, which was due out any day. She asked me to do this for her during my visit in December 1984, perhaps at the same meeting when I took the photograph of her that appears on the facing title page. When Lisnyanskaya re-entered the literary scene in Moscow in 1987, she did so as a major poet of her generation. A dozen publications in leading journals lead to the 1991 publication of her volume Poems, which she inscribed for me: “For dear Ron, who knows almost all the poems here. With love and gratitude.” I know the poems because the majority comes from the two volumes published abroad, and I typeset the second one. Ronald Meyer, a member of the PEN Translation Committee, teaches the seminar on Russian literary translation at Columbia University. He worked as Senior Editor at Ardis Publishers from 1981 to 1991. 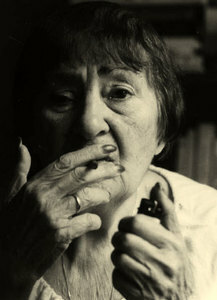 Inna Lisnyanskaya was a founding member of Russian PEN Center. Daniel Weissbort translated a good selection of her verse in Far from Sodom (Arc Publications, 2005). Rowan Williams, Archbishop of Canterbury, includes a handful of translations of Lisnyanskaya in Headwaters (Perpetua Press, 2008).